Wonderful Benidorm villa with stunning penthouse views of the sea Mountains. Lovely villa in the beautiful Sierra Cortina resort, perched in between the mountains and the sea,with stunning views of the med. The villa comprises of 2 double bedrooms, 2 bathrooms en suite, and a downstairs wc, It is fully air conditioned and heated, and has a 40' lcd tv, with bbc & itv. Internet is available but chargeable. The living room also has two leather settees, dining table, The kitchen comprises of fridge freezer and dishwasher oven and hob,and also a microwave and washing machine. The outside area has a dining table with 6 chairs. The master bedroom has large king size bed with air con and small plasma TV. The second bedroom sleeps 2 also with air con, and the downstairs lounge has 1 pull out bed. The location is only 2 minutes from Terra Mitica theme park , and world class golf courses, also the large la marina shopping centre is only 2 minutes away with its numerous restaurants bars shopping centre etc, and Benidorm only 3 miles away, there is a tennis court and 2 pools to choose from . As for la cala de finestrat bay , it is very beautiful and relaxed, there are many bars and restaurants around this horseshoe shaped bay, sunbeds are available, along with various cuisines, tapas , chinese, italian, mexican, virtually everything you could wish for is in la cala, there is also a irish bar and various English bars there Good for sport etc. 'Leisure information': Nearby the Villa you will find two championship golf courses both 18 holes, one is a long course and one is a shorter course, there is a lovely golf club with a bar and restaurant, where you are welcome to enter, the vistas from here are breathtaking, all you will need is a set of golf clubs and you can pay to play, We leave a set of golf clubs there is a set in the villa for your use, also there is a driving range here, this is open to everyone. There is also a pitch and put course on the complex, tell them that you are a resident in sierra cortina and you will recieve a discount ! The world famous Terra Mitica theme park is just a two minute drive away, with it,s numerous thrilling rides, there is also a zoo and nature park here, water parks and aqualandia are also near by. In la cala you will find a banks a post office, supermarkets, and numerous , eateries. There is also a gym and spa nearby, which has a indoor pool , bar and restaurant. Benidorm of course is only 3 kilometres away with all of its show bars and restaraunts and two fabulous beaches .Don't forget the old town of Benidorm with its many tapas bars and narrow streets , it really is charming. PARTY BOOKINGS: Please contact us Thanks. WIFI: Wifi is available but chargeable. Hi , and thanks for reading about us, we bought this property in 2005, and we lived there happily for 5 years, Family matters ie, Grandchildren brought us back to the uk lol. We like to think it is "home from home", and we still spend a lot of time there ourselves, every aspect of the house is upon luxury, and we are sure you will have a relaxing time in spain. Walking or beaches ! you have the best of both worlds here, there is the charming village of finestrat in one direction, and the coast and its lovely white sand beaches the opposite way, totally stunning scenery which would suit everyone. Both bedrooms en suite , the master bedroom has a full bath toilet and bidet, the second bedroom has shower wash basin and toilet. There is also a downstairs WC. Ample parking facilities a few metres from the front door. All cutlery supplied, glasses, Home from home feel. Full kitchen with dihwasher, washing machine , fridge freezer, cooker , microwave, utility sink. There is a table indoors with 4 chairs . or a outside table with 4 chairs and parasol for al fresco dining. Lcd tv with english tv bbc1 . itv etc. Stereo for your use . Some cds for you to choose. front and back gardens, both with gates. 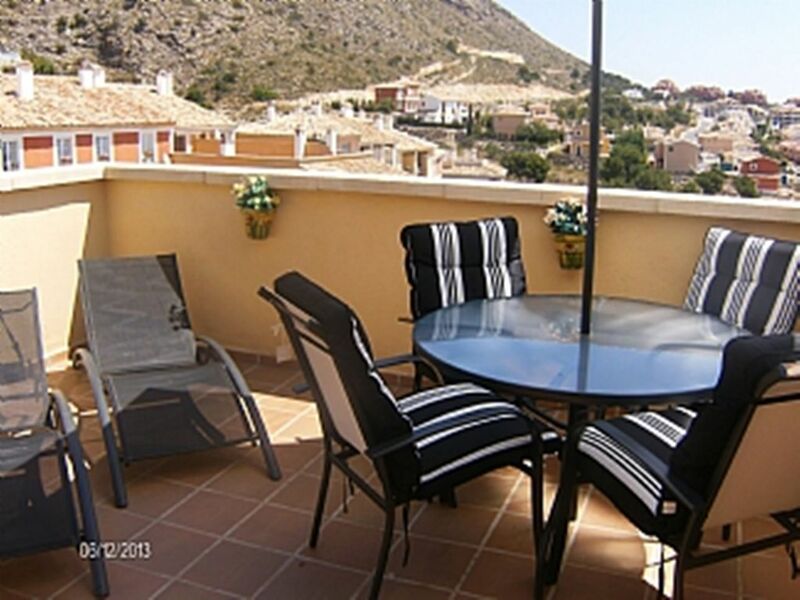 Front and back gardens to sit in and a wonderful roof terrace with fabulous views over benidorm and the med . Tennis court available on sight. Two lovely communial pools for you to choose from. The villa is situated on three floors ,so it is probably not suited to the elderly or infirm, as there are quite a few steps,up to the bedroom, and sun/roof terrace. a car is recommended for this area, although there is a regular bus service, which runs into la cala de finestrat, There is a gas barbecue in the back garden for your use, there is also a outside dining table and six chairs, where you can soak up the sun ,or just relax in the shade, with a cool glass of vino. Right at the very top of the house you will find a beautiful sun/roof terrace, where the views are incredible, you can see for miles here, over to benidorm and the med, and the surrounding mountain ranges, There are some lovely walks in the area too, you could climb the highest mountain in the region, which is named puig campana, i believe it will take about 7 hours, you reach the trail in the charming little village of finestrat, which is close to the property, here you will find a font, with free mineral water. Many thanks guys. We are so pleased you enjoyed your stay. We would love to welcome you back to stay in the future. Kind regards .Liz and Don. thankyou so much for your comments, we are so pleased that you enjoyed your stay, and of course you would be welcome anytime inthe future, many thanks, liz..
We have just returned from a 4 night break in the villa, and had such a lovely rest there, we did not do much except relax, The villa itself is better than the photographs portray and we shall definitely return in the future, but will stay for a longer vacation. many thanks for a special time there. Many thanks, i am really pleased you enjoyed your stay. and you would be welcome anytime it was a pleasure..
Nice quiet location and well kept communal gardens. The house was comfortably furnished but agree with comment re cleaning in previous review. The house could have been cleaner - particularly the kitchen. Unfortunately the house was cold and damp, even though weather was gorgeous, 21c and sunny. There was a lot of black mould on the walls of the main bedroom which was spreading, forcing us to move out just 3 weeks into a 3-month stay. Owners were not at all apologetic or understanding and we had great difficulty in getting our deposit returned. I really don't understand this review, the persons moved out after 1 month of a 3 month stay, and their deposit was returned instantly to their bank account. Also the house has heating in every room, at no extra cost, so there is really no reason to be cold. Upon inspection we could find no dampness in the house. I believe in honesty ,and i will do anything i possibly can to make sure that people enjoy their stay here. Finally i really do hope that there are no hard feelings between the sunseekers too, and ourselves. We booked this villa because of the golf in the area,there are great courses in this area now. The house itself was very pleasant and comfortable, also the vistas are outstanding from the sun terrace, would recommend a stay in this lovely property. Thanks for the review, i am so pleased that you enjoyed your stay , and the golf ! It was a pleasure.. Myself and 2 friends stayed in the villa and had a very pleasant stay, the house is very neat and tidy, and tastefully furnished, I hope to return to stay again next year. Many thanks, i am so please you enjoyed your stay, hope to see you again soon.. The villa is just 2 minutes from terra mitica and 2 minutes drive from la cala de finestrats beautiful 'horseshoe bay' which boasts a blue flag beach, with its numerous gastro delights, here you can choose from the lovely spanish tapas, there is also wonderful Italian restaurants and of course British bars, these all surround the waters edge, so why not sip a glass of sangria and watch the sun go down here. Just 2 minutes drive from the villa there is a large shopping mall named the la marina, with its large cinema ,bowling,eateries bars and popular stores like c&a, zara, h&m. 5 minutes drive from championship golf courses,and driving range,there is also a pitch and put course for beginners which is another facility within walking distance. Nearby there is also a health centre with indoor pool sauna fitness machines etc. All in all everything you need for a great holiday ,whether you want relaxation or tranquillity it is all here, and of course Benidorm is only a 5 minute drive away. Golf: There are two 18 hole championship golf courses within a 2 minute drive,also , a pitch and put 18 hole, and 9 hole pitch and put, within a short distance. Security deposit of £200.00 payable when booked, please ask for rates for fiesta weeks and school holidays. Long term rental is also available, please ask for rates.for this luxury property. minimum 3 months.. All moneys have to be paid 8 weeks prior to arrival. " SUMMER SPECIAL, 2 WEEKS FOR £899 FROM 1ST JUNE TO THE END OF JUNE "